This zone is located between Tierra de Barros and the mountain range of Sierra Morena, in the Via de la Plata (the actual name comes from the Roman name ‘Via Delapidata’, as paved road), the old route connecting the north and the south of Spain. Zafra, Feria and other towns in this zone were very important medieval towns (for Arabs and Christians), and they holds all that flavour of past ages. History, culture and traditions goes together in Zafra, also called ‘Sevilla la Chica‘ (little Seville). There are many interesting monuments in this town: the Palace of Duques de Feria (a defensive castle, but decorated as a palace) or the Plaza Grande and Plaza Chica, two beautiful squares in the old center of the city. 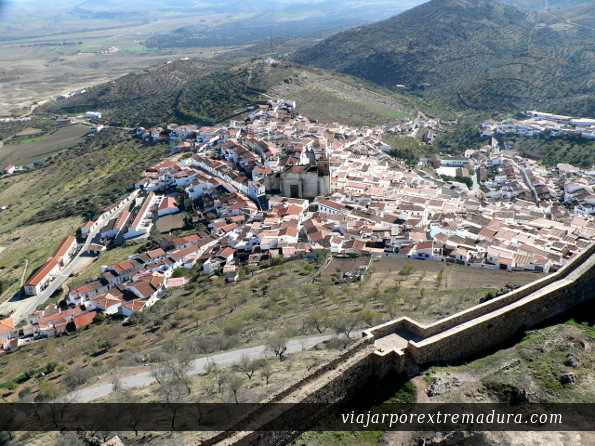 Feria is a typical Spanish town, builded in a defensive position on a mountain range, under the protection of its beautiful castle. It was a important center of domain in the Middle Ages. The visitor can visit the castle and can go up to the top of the main tower: the landscapes from that point are really beautifuls.